(Click on the image to enlarge) Over this labor day, it’s good time to review what the US labor earns. 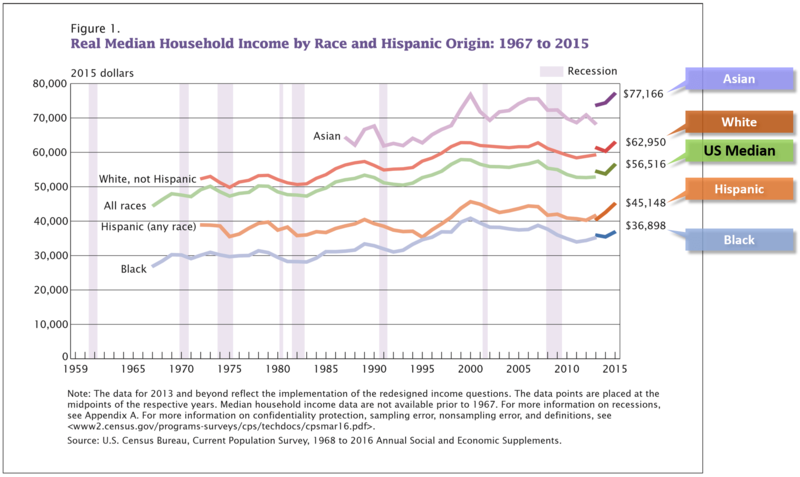 US household income is relatively flat for more than fifteen years for all races. After peaking in late 1990s, there has been no increase, especially in the last ten recession years. Despite a 5.2% annual increase in 2015, it was still 2.4% lower than the peak in 1999. This is true across all races with Blacks and Hispanics showing a larger gap to the historic peak. Asian households in US have an almost 40% higher median income. This can be partly explained by their concentration in highly educated tech jobs. Also, the stringent immigration laws prevent any lower income workers from Asia to immigrate (those tend to go to Latin & South American Hispanic population). A strong focus on education & concentration in urban high income neighborhoods also skews the Asian household income. Blacks have almost 30% & Hispanic households about 20% lower income than the US median. In fact, Asian household income is more than double the Black households, which have a strong concentration in lower income areas including the poorer southern states. Concentration into inner cities, lower education, and much higher proportion of single family households also plays against Black households. Hispanic families suffer from a generational bias, with majority of them or their parents starting out in lower paying jobs. What this data doesn’t show is that Northeast & West US, at about $62,000 have more than 20% higher income than Southern US & about 10% higher than Midwest. The incomes in Metropolitan areas, at $64,000 are almost 50% more than outside regions. Additionally, households aged 45-54 years have peak income at $74,000 and naturalized citizens have, at $62,000, 20% more income than native born & 40% more than non-citizen households. Source: Income & Poverty in the United States, 2015 from www.census.gov.